Elastics are small elastic bands that you hook to your braces to supply the pressure needed to move teeth and jaws into their correct position. You are responsible for placing your elastics on your braces as instructed. If you are instructed to wear them all the time, please remember to remove them when brushing your teeth, gums and braces after meals and then put them back on immediately. Forgetting to wear your elastics will prolong your treatment. 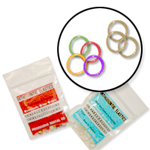 Always carry spare elastics with you, so if one breaks you can replace it right away. If your supply is low, call the office to arrange to pick up some more or if necessary we can mail you some. If you happen to forget to insert your elastics one day, don’t double up the next — just follow your regular instructions. Elastics get tired. When they lose their stretch, elastics don’t provide the proper pressure on your teeth and jaws. So it is very important to change them quite a few times during the day, even when they are not broken. If you have any problems — like elastics breaking frequently, a wire or band loosening, or a hook breaking off - call the office immediately. Don’t wait until your next scheduled appointment. These problems need to be corrected as soon as possible to help keep your treatment on schedule. Elastics may cause your teeth to hurt a little at first. That’s because the teeth are moving, which is our goal. Usually the tenderness lasts only a few days. Not wearing your elastics as instructed will only make the tenderness last longer, and tooth movement will require more time. Remember, wearing your elastics faithfully, following all instructions, and keeping appointments is the quickest, easiest way to achieve our goal — a lifetime of healthy, beautiful smiles.